Heat exchangers are a critical process component and when repairs are needed, they are often needed quickly. When time is critical and you need your heat transfer equipment repaired quickly and correctly, Metalforms has the expertise and capabilities to handle all types of repairs to get your unit back up and running. Our QC staff will inspect your gasket surfaces by sandblasting in order to provide better visibility of base metals and any defects that is typically obtainable at the plant, for any damage that may need repair. As a standard, we will contact our customer and offer them the opportunity to review our findings prior to commencing any repairs. 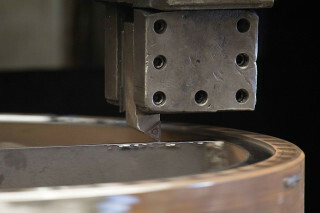 Depending upon the severity of the defect found, we will perform weld repairs using ASME Section IX qualified weld procedures and re-machine gasket surfaces to meet original specifications. While working closely with our customers, we will know exactly which type of weld repair that they need, and make sure that their specific needs are met. At Metalforms, we will remove any existing defects by following the ASME Section IX qualified weld procedures. The most common types of weld repairs performed by Metalforms are weld build-up repair of eroded or corroded areas, removal of cracks and re-weld those defects, and weld build-up for reclaiming gasket surfaces. While being proficient in weld repairs, we also have the ability to inspect and replace pass partition plates in it’s entirety or partially. By blasting and inspecting the part, we will gouge the old pass plate out of the channel, and clean, fit, and weld your new pass plate to the bundle. To be able to identify the specific procedure, we will sandblast the destructed areas to provide better visibility for us to repair your distinct needs. Metalforms, also performs in-house, non-destructive examinations that are required by ASME and the National Board of Boiler and Pressure Vessel Inspectors to meet the specific needs of our customers.